The Montfort Lewis is available as either an English pool table using 2" size balls or as a American pool table using 2 1/4" size balls. It uses a single piece slate bed for all size options which are 6ft, 7ft, 7.2ft or 8ft. It can be purchased with matching dining tops and benches, making it a pool dining table. The Lewis is a part of the Design Range from Billards Montfort, and is manufactured in either solid beech or solid oak. Its modern yet refined style will fit in perfectly with many types of décor. The clean lines, flush cabinet and square legs give this table an incredibly modern and contemporary look. We feel this is one of the most beautiful tables on the market. The Lewis is available in either English Pool, American Pool, or for Carom (very popular in France, South America and Southern Asia). Carom - played with three balls, one white, one spotted white and one red. This table is available in 6ft, 7ft, 7.2ft and 8ft sizes. This model of the Montfort Lewis is shown in High-Gloss White. However, a huge range of finishes is available on the Lewis. If you would like a different finish, please see our other listing. Alternatively, you could choose from a huge choice of high gloss paint colours from the RAL range is available for you to specify your new pool table to be made in. Black or White are by far the most popular options, but you may choose to have something more individual to suit your décor. Click here to see the choice of colours. Drop Pockets - the Lewis is supplied with American style drop-pockets as standard, where the balls sit in the pockets once potted. Ball Return - alternatively the Lewis is available with a retractable ball return system. Balls are collected underneath the body of the table for easy retrieval, yet the tray remains unobtrusive and doesn't detract from the overall look of the table. When not in play the ball tray clips up underneath the table and is completely hidden away. You would never know it is a pool table when the dining tops are in place. Please note that if you choose to have Carom pockets you will not need a ball return, as the balls never enter the pockets in Carom! 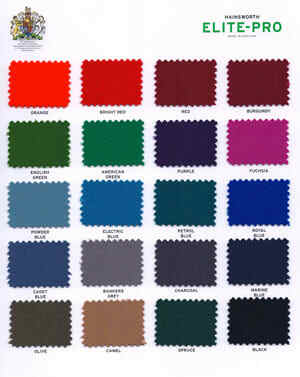 Other colours are available, from the samples shown below, at extra charge. The type of cloth we recommend for American Pool is Elite Pro cloth. This is a performance cloth that delivers big on value and longevity whilst offering excellent speed and ball response. Some players choose this type of cloth for English Pool, if they want a faster game. You can also add a 40cm extension to your table top that will sit in the middle, making your dining surface longer overall and accommodating more people. The complete range of table top designs is displayed below, but your table top can be made in the colour you desire to match your décor. If you wish to have your table top made in one of the pre-existing colours, please select from the drop-down menus at the top of the screen (remembering to select 2 Piece or 3 Piece table tops as appropriate). If you wish to have your table top made in a custom colour, please select the appropriate Custom Finish option, and we will contact you to confirm your choice of colour. You can always contact us on 0800 622 6464 or 01454 413636 if you wish to discuss which colours are available to you. If you are planning to use your table for both dining and pool you may find the additional option of benches appealing. These are made to match the finish of your table and simply slide underneath when not in use. The advantage of using these is that you don't need to find somewhere to store the chairs when playing pool, or having to put them to the side of the room. You can buy these singularly or in a pair. The price shown is when bought at the same time as the pool table and shipped simultaneously. If you decide to order these once your table has been delivered the cost will unfortunately be considerably more. Cushioned benches with upholstered tops are also available. These ultra-luxurious benches provide the ultimate combination of comfort and practicality. Please note that the bench pictured above has stainless steel legs, and that if you choose a wooden finish for your table, your benches will also have wooden legs. You can instead choose to add benches with accessory storage, if you prefer. These benches will hold all the equipment you need for a game, including cues, rests and balls. They are available in beech or oak, or in gloss paint in a variety of colours. By default these will be supplied in a matching finish to your table. If you would like them in a different finish, please contact one of our sales team on 0800 622 6464 or 01454 413636 to discuss your options. If you are planning to use your table for both dining and pool, there is also the option of adding chairs. There are a wide variety of chairs available in finishes to match your choice of table. Because of the wide variety on offer, if you would like to add chairs to your order please contact one of our sales team on 0800 622 6464 or 01454 413636 and we will be happy to supply you with a quotation on price. You can add a two piece wall rack for up to six cues, matched to the finish of your table. Please use the drop-down menus at the top right of the screen to add a wall rack if you wish. You can add a score counter for keeping track of match progress, matched to the finish of your table. Please use the drop-down menus at the top right of the screen to add a score counter if you wish. Pictured above are the cue rack and score counter in Montfort's Teak finish. If the table needs to be made to order it will take approximately 6 to 10 weeks to be made. Once completed, our delivery team will contact you to arrange a delivery date. I purchased this table without viewing as it was too far to travel - The manager at Home Leisure Direct gave me his word on the build quality of the table and I was not disappointed - stunning centre piece and fantastic playability. Thanks for leaving us some feedback. It's great to hear that you're so pleased with your new Billards Montfort Lewis pool table, they really are stunning tables. I hope it's had a lot of use over the Christmas season - we'd love to see some photos if you fancy sending some into us.